1936: Soldiers of the Third Reich roam the world seeking occult weapons for their insane plans of conquest. When Fenton Paddock, a former British soldier and hapless smuggler, is asked to look for his friend Richard, who went missing in Tibet, he has no idea that this search will lead him across three continents to a secret that could turn the whole world upside down. Enough mystery? Not in the mood for another crime story? 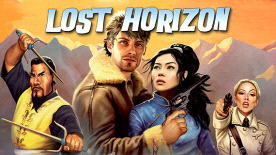 "Lost Horizon" brings the classic adventure back to its roots: the 1930s, exotic settings all over the world, and the dangerous quest for one of the greatest secrets of mankind makes adventurers' hearts beat faster. The Makers of the award-winning Secret Files series invite you to experience a technically outstanding, carefully designed game featuring an absolutely thrilling story at the side of Kim and Fenton.